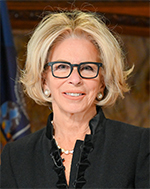 Janet DiFiore, Chief Judge of the Court of Appeals and of the State of New York, was born in 1955 in Mount Vernon, New York. She graduated from C.W. Post College, Long Island University (B.A. 1977) and from St. John’s University School of Law (J.D. 1981). She was admitted to the Bar of the State of New York in 1982. Chief Judge DiFiore served as an Assistant District Attorney in the Westchester County District Attorney’s Office from 1981-1987, and from 1994-1998 as Chief of the Office’s Narcotics Bureau. From 1987-1993, Chief Judge DiFiore practiced law with the firm of Goodrich & Bendish. In 1998, she was elected a Judge of the Westchester County Court, presiding over criminal and civil matters and sitting by designation in the Family Court, Surrogate’s Court and Supreme Court. She served as a County Court Judge until 2002, when she was elected a Justice of the New York State Supreme Court. As a Supreme Court Justice, she served as Supervising Judge of the Criminal Courts of the 9th Judicial District. In 2005, Chief Judge DiFiore resigned from the bench and was elected Westchester County District Attorney. She served in this position from 2006-2016. On December 1, 2015, Governor Andrew Cuomo nominated her to the position of Chief Judge of the Court of Appeals and the State of New York. On January 21, 2016, her nomination was confirmed by the New York State Senate. Chief Judge DiFiore lives in Bronxville, NY with her husband Dennis E. Glazer. They have three grown children and two grandchildren.